68 days. 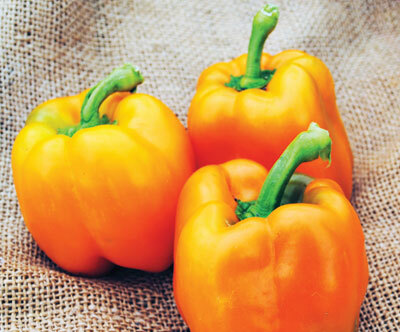 (green > golden orange) [Dutch variety, 1991] Fancy, flavorful, very sweet bell pepper often featured in gourmet produce markets. 3½ in. fruits are 3- to 4-lobed, averaging 6-7 oz. Fruit stem separates easily from plant for trouble-free harvest. Choice variety for salad use. Good foliage cover of fruits. 4 ft. plants. Mosaic resistant.